Your supervisory personnel, including managers and team leaders, have a valuable job—keeping your business moving forward safely. Are you confident your team is keeping that promise to your organization? How can you ensure the ongoing wellbeing of your personnel while they contribute productively to your operations. Although some organizations have the resources in-house to self-monitor their employees’ safety, many businesses benefit from centralizing this responsibility with a dedicated monitoring partner such as Blackline’s Safety Operations Center (SOC) or an Alarm Receiving Center (ARC). Here we explore top elements for a successful safety monitoring program with centralized safety monitoring. If a few areas of your checklist are not up to par, you can count on Blackline. Our in-house Safety Operations Center (SOC) is there to fill in the gaps across the United States and Canada, helping to keep your employees confident and safe. In the United Kingdom, our accredited Alarm Receiving Center partner provides industry-leading live monitoring services. Blackline’s Safety Operations Center and Alarm Receiving Center are much more than a traditional call center that often balances message-taking, help desk and telemarketing services. Black line’s SOC and ARC partner are staffed with fully-trained monitoring agents focused exclusively on safety-related activities. All safety alerts are managed from receipt through resolution in an efficient manner according to your custom emergency response protocol. 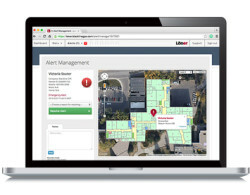 Both services manage all safety alerts triggered by employee-worn Loner® devices and smartphone application, including detected falls, person-down events, and manually-triggered help requests. Through efficient management of all incidents from receipt through to resolution, employers can maximize their ability to make a difference when an employee requires assistance. Blackline’s monitoring agents have the infrastructure required to escalate to local 9-1-1 services in the United States and Canada, and by unique police access or 112 services in the United Kingdom. Escalation occurs based on direction from your organization and according to emergency response protocols. Blackline’s SOC monitoring agents make use of live language translation when required to ensure nothing gets in the way of managing the lifecycle of all safety alerts efficiently and comprehensively from receipt through to resolution. To help your business stay focused and productive, Blackline’s SOC can assist employees who have generated a false alarm with an in-the-moment training refresher. No matter where an employee is located—within buildings, populated areas or the remote reaches of our planet—Blackline provides a complete suite of employee safety monitoring solutions to match the challenge and make a difference. Available in the United States, Canada and the United Kingdom, our live safety monitoring services provide organizations the option of an expert monitoring service that allows your supervisor roles to stay focused on your business activities.